A special formula for Deficient Kidney and Liver Yin. Nourish kidney and liver, clear Empty Fire. 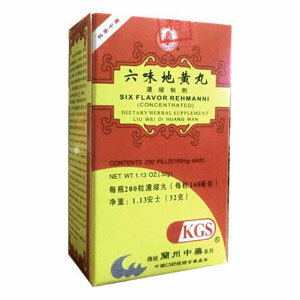 Liu Wei Di Huang Wan – Six Flavor Rehmanni is a special formula for Deficient Kidney and Liver Yin. Nourish kidney and liver, clear Empty Fire. Headache, dizziness, tinnitus, poor hearing, debility of the lumbar area, lassitude of the legs (patient cannot stand for long periods of time), low-grade afternoon fever, night sweating, difficulty urinating, diabetes, nocturnal emission. Nephritis, Deficient Yin type of diabetes, tuberculosis, hyperthryroidism, mild emotional disturbances, abnormal cell growth in esophagus (epitheliosis). Take 8 pills, 3 times a day. Children, reduce proportionately.